This evening I read the April 1 issue of Our Sunday Visitor. In it was an article on Mother Teresa's spirituality which talked about her "Five Finger Gospel." It consists of five words from Matthew 25: "You Did it To Me." These words refer to Jesus telling his followers that "whenever you do something for the least of my brothers, you did it to me." This is so important to remember and so easy to lose sight of. Whenever we serve those around us, whether they be our children, our spouses, our friends, or our worst enemy, we do it to and for Jesus. "Dear children! I desire to thank you from my heart for your Lenten renunciations. I desire to inspire you to continue to live fasting with an open heart. By fasting and renunciation, little children, you will be stronger in faith. In God you will find true peace through daily prayer. I am with you and I am not tired. I desire to take you all with me to Heaven, therefore, decide daily for holiness. Thank you for having responded to my call." Here is a great article on Catholic Exchange for all you single women out there who dread the question: "Why aren't you married?" I'm sharing this on behalf of Heidi Saxton of "Canticle" magazine which I have had the pleasure to write for in the past. If you can, listen in. I'm sure it will be wonderful! well as the new Catholic writer's blog, the "Silent Canticle"
grandmother's family -- then tie up the phone lines on Lisa's behalf! I will let you in on a little secret. Some days I don't want to pray. I'm tired or don't feel well or the list of items on my "things to do" list has reached such epic proportions that taking the time to pray seems like a true imposition. Sometimes I just want to do something else - read the paper, listen to music, etc. And yet, I pray anyway. Prayer should be done out of love, not obligation. Love, however, sometimes requires great effort. Just like love between human beings, a relationship between God and us requires communication and time. It requires putting in the effort even when the feeling isn't there. I know I need to pray. When I don't pray, my day is a mess. I'm short-tempered and restless. I don't want to do my daily work and when I try, I can't figure anything out. Prayer puts me in line with God. It helps me to do His will, instead of following my own floundering ideas. God is always speaking. Prayer allows me to dial in so that I can hear. There are days when prayer will definitely be a struggle. If you try, you can always find an excuse not to. I invite you to do it anyway. Make it a habit that you do no matter what. Your life will be better for it. Each spring, my city library system conducts a "one book" program. The idea is to get as many people in the city reading and talking about the same book. This year's pick is "tuesdays with Morrie" by Mitch Albom. This book came out 10 years ago and was a huge bestseller but I had never read it. I read it the past few days. It tells the true-life story of Mitch Albom's visits with Morrie Schwartz, a former college professor who is dying of ALS, also known as Lou Gehrig's disease. Over the course of twelve Tuesdays as Morrie gets progressively weaker, he imparts his wisdom to Mitch. He basically gives a course in how to live and how to accept death. It's very simple. As you grow, you learn more. If you stayed at twenty-two, you'd always be as ignorant as you were at twenty-two. Aging is not always decay, you know. It's growth. . . All younger people should know something. If you're always battling against getting older, you're always going to be unhappy, because it will happen anyhow. . . You have to find out what's good and true and beautiful in your life as it is now. Wise words from a dying man. This book is full of them. It is well-worth reading. In most of her works, Amy Welborn has a very straight-forward direct writing style. A forty-something mother of five children ranging in age from toddler to adult, former teacher, and accomplished writer and blogger, she comes across as a woman not to be messed with. Her beliefs and her faith are rock-solid and she will defend them to the death. In "A Catholic Woman's Book of Day's," I wasn't sure what to expect. I was pleasantly surprised to meet a softer side of Welborn. This book offers a reflection for each day, beginning with a scripture verse, then Welborn's comments, and concluding with a short prayer. In her reflections, Welborn shares stories from her own life, her struggles with parenting and her career and her pain at not being able to be at her mother's side as she passed away. She conveys all the hopes and prayers that all of us who struggle to make our way in the world can relate to. She speaks of having difficulties with her spiritual life at times and finding the faith to keep going. She offers her prayers of thanksgiving and praise and contrition and petition. She invites us to walk a year's journey with her. These short reflections are perfect for a quick jolt of spirituality in the morning, or anytime in the day when you have five minutes to spare. 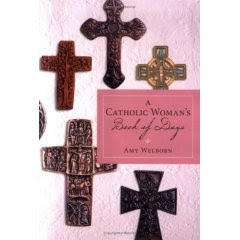 Welborn has outdone herself with "A Catholic Woman's Book of Days." At mass this Sunday, our pastor called up two young men from our parish to receive a special blessing. They are brothers who are leaving for Army basic training this week. As he announced this and invited all of us to bless them with our prayers, my nearly six-year-old son David asked me what was going on. I told him, "Mrs. Jones's sons are going into the army." He looked at me in horror and said "But they are going to die!" I told him I hoped not and we joined in the prayer. Every mother in the Church, however, including me, was sharing in that mother's pain and fear. The woman in front of me with a teenage boy of her own just kept shaking her head. My eyes welled up with tears. To think about giving one child over to the armed services is hard enough to accept. The thought of giving two at the same time is almost too much to comprehend. Yes, we need brave men and women to defend our country. My nephew Jeff is in the Navy and has just finished his first year of service. He has been enjoying it very much and is even considering becoming a "lifer." Yet I know how hard it is on his mother. At some level, all mothers know that their children could die at any time. Accidents happen. People, even children, sometimes get sick. But it is different to have them purposely put themselves in harm's way, no matter how noble the cause. What an act of faith to entrust them to God's care and to accept that whatever happens, God can bring some good out of it. Unfortunately, during this time of war, the blessings for our parishioners going off to fight are becoming more and more common. We sent off one soldier to Iraq just a few weeks ago with his fiance standing by his side. Our pastor indicated we had another young man leaving in May. Every time it is heartbraking. Every time you feel for the loved ones left behind. There is a bronze plaque in the sacristy of our Church listing the men of our parish who died in World War II. There are about 25 names listed, preserved forever in cold metal. But it was the inscription at the bottom that made me catch my breath - "Holy Name Moms." This plaque had been put up by the mothers who had lost the children they had given birth to and nursed and cared for and tucked into bed at night. They had lost their little boys. I imagine most of those mothers are long since deceased and reunited with their children up in heaven. Yet, here we still are, over sixty years later, still giving over the children of our parish to the horrors of war. When will this insanity end? When will our prayers for peace be answered so that no mother will ever have to make that sacrifice again? Marriage making us Holy rather than Happy? What If Marriage Is Meant To Make You Holy Rather Than Happy? What if we started being holy in our marriages? What would that look like? How would our responses change? One of the coolest things about being a writer is actually seeing something you have written in print. Most of my writing is done for the web and I enjoy the immediacy of the medium. I write something, submit, and generally within a week or two it is up for the world to see. Here on my blog it is up immediately! Writing for books and magazines is much different. There are long lead times. You submit something and then wait to hear, get a piece accepted, and then wait some more. So, over a year ago, I had two prayers accepted for this new anthology "Miracles of Motherhood: Prayers and Poems for a New Mother" by June Cotner. This week I received both my payment for the submissions and two copies of the book. I read it cover to cover that day! The very fact that God has placed a certain soul in our way is a sign that God wants us to do something for him or her. It is not chance; it has been planned by God. We are bound by conscience to help him or her. This book would make a wonderful gift for any expectant or new mother. When we are tense or stressed, our breaths become very shallow. One simple way to relax no matter where you are at the moment is to stop and pay attention to your breathing. Actually feel yourself inhale and exhale. Count your breaths (it will help keep you focused) - usually counting 9 breaths works to help you relax. I have started doing this when I go to sleep at night and I find it clears my mind and has me asleep before I ever reach the count of nine! I am also trying to remember to breathe during the day when I start feeling like life is a little out of control. Try it! Let me know how it works for you. Holiness for Housewives (and other working women) by Dom Hubert Van Zeller was originally published in 1951 under the title "Praying while you Work." This is an updated, abridged version, but its message is just as relevant and perhaps even more needed today as it was fifty years ago. It can be hard to find the spirituality in daily life, to find God amidst the dirty dishes and the laundry and the meals to be cooked. It is important to think of being a wife and mother as a vocation. God has called us to this life and God will give us the strength to carry out our duties. The most important thing to do in life is God's will. "Apart from the accepted will of God, nothing has lasting reality. So if God wills that you should be bowed over the sink instead of over the pew in your favorite church, then washing dishes is for you, now, the most perfect thing you can possibly do." Van Zeller acknowledges that there will be times when we will want to escape. "There are times in the life of a wife and mother when almost any other setting is felt to be preferable to hers. . . You may come to feel a loathing for your husband, your children, your home, and your society. You may find that your religion has turned sour on you. You may give up hope of ever finding happiness again . . .you are being given the grace to get the best out of the situation." Van Zeller emphasizes that we must strive to make all our time holy by offering it to God and by stopping throughout the day to offer brief prayers. Even our leisure time must be a gift to God. We must strive to use our time as He wills us to do so. One brief section of the book deals with obedience to one's husband, an idea no longer emshrined in wedding vows and one which no doubt most modern women would object to vehemently. Van Zeller maintains that a wife must obey her husband in all things unless what he asks contradicts what God asks. That is an important concept even today. Husbands can never make us do what is wrong. We answer first to God. The conclusion of the book offers "Prayers for Housewives," a reference of both basic prayers and prayers for special needs. Holiness for Housewives is a wonderful little gem of a book, a real reminder that God is in the details of daily living and that if we are living the life God called us to, our sanctity is found there as well. My four-year old son Isaac has reached the "fearful" stage of development. This is a completely normal thing, but a very unpleasant happening. All of a sudden, the world becomes scary. The imagination goes into overload. Nightmares become routine. "Mama, don't leave me! Come lay with me!" His fears are real and my job becomes trying to comfort him while at the same time helping him to realize he has nothing to fear. The shadows really aren't scary monsters coming to get him. The dreams aren't real. Everything is OK.
My boys and I say what they call the "bad prayers" every night - basically prayers to God for protection from bad things like fires and burglers and things that especially scare them like tornados and tsunamis. We pray for no bad dreams. A while back, we found out that Raphael the Archangel is the patron saint of nightmares, so we pray to him for added protection as well. The night is scary. I say my own "bad prayers" before I go to sleep at night. I rest better knowing that I have placed myself and my family in God's hands. But it is not only physical darkness that scares us and leaves us feeling vunerable. Emotional darkness does that as well. When our lives our falling apart, when we are suffering from abandonment, depression, or loneliness, when people we trust have failed us, we are in the darkness of life. As much as we might like it to be, life is not always happy. There are days in the desert for all of us. While we always need God, these are the times that we seem to need God most. When we are in the darkness, we have reached the end of our personal resources to deal with the situation. When we go to sleep at night in the physical darkness, we are out of control and need to trust that the morning will come. In the emotional darkness, we need to turn our lives over completely to God and wrap ourselves in His love, trusting that someday the light will once again come. Hope is what sits by a window and waits for one more dawn, despite the fact that there isn't an ounce of proof in tonight's black, black sky that it can possibly come. Naaman the leper was taken aback because his cure was so simple. He was prepared to do great things to have his healing take place. Often we are like this. We wait for God to tell us to do great things, and then, we say, we will respond with a willing heart. More often than not, however, God asks us to do the simple things. God asks us to be a good person, to be kind to others, to care for our spouses and our children, to do our jobs to the best of our ability. Yes, sometimes God asks us to make radical changes to our lives, but often the call is to live a Christian life right where we are. The cold weather broke and the past three days have been beautiful and warm. It feels so good to be outside with the boys, able to go for walks and play on the gymset. Granted the entire yard is currently mud and we need to wear our boots to go out in it, but the sun and the warmth and the fresh air feel so wonderful. I have to thank God for days like this. It is one of those days when my stress level seems to have reached maximum capacity. I am currently working on four different work projects. I do appreciate the work. I can definitely use the income. But my husband has also been overloaded with work lately which means that he isn't around to contribute to the parenting duties at all. While I am the primary caregiver for my children, I do look forward to having a half-hour break on some days just to take a breather when I can say that Dad is in charge and I am going to exercise or check email or just go to the bathroom without someone carrying on a conversation with me outside the door. At times like this, I feel like everything depends on me - making sure that my husband gets to do his job in peace, that the children are cared for, and that my own work gets done. But then I remember, God is in this with me. In this season of Lent, God invites us to accept our crosses, all the while insuring that He will be there to help carry them. Dear God, when I get overloaded, help me to remember to turn some of the burden over to you. A few weeks ago at the grocery store, my husband and I ran into an acquaintance from church. She mentioned that she and her son were no longer attending mass, although her husband was continuing to go. Her son is twelve and autistic. They had been allowing him to bring a hand-held video game to church to help him be quiet, but they had been getting evil glares from some of the members of the congregation who sat near them. She didn't want to have to enter into discussions with these people to explain her son's mental challenges so she simply stopped going. We encouraged her and her son to come back. We invited her to change her seat and come sit near us in a section that seemed to be somewhat more tolerant of disruption. I asked her to please not stop coming to church on the account of a couple inconsiderate people. She and her son were both welcome. To date, we haven't seen her return. We attend the children's mass at our parish, a service that could never be described as quiet. With two active young boys, I am so thankful for the opportunity to worship with other families who are also trying to teach their children how to behave in church. The church is crowded, which at a time of declining church attendance, is wonderful to see. The children look forward to getting the children's bulletins and to going up around the altar to listen to our pastor give the homily. They enjoy the lively music. Teenagers do the readings. The service has meaning for our children and us as well. At times, through necessity, we have ventured to attend other masses and have also experienced the evil glares when our children have acted up. While I understand my fellow parishioners' desire for a prayerful mass experience, I wish they would understand that I really am doing my best to have my children sit still and be quiet. My children will not learn how to behave in church if they don't go. Leaving mass feeling like you have been condemned for your mothering ability is never a pleasant experience. While it would never make me stop going to mass, it has certainly tempered my enthusiasm. When I was a child, a priest at my parish would begin the mass by welcoming us to a "family meal of celebration and faith." We all are members of God's family, from the tiniest baby to the oldest senior citizen. God's family includes those who are mentally and physically challenged. It includes those who suffer from addictions and mental illnesses. It includes the homeless person and the multi-millionaire. It includes those of every color. We all are family, brothers and sisters in the Lord. We should all be welcomed at the Eucharistic table. No one has the right to make someone feel unwelcome. In fact, the opposite is true. We should greet our fellow worshippers with kindness and understanding. None of us is perfect, but all are welcome here. There are so many activities for children today. From the time that they are born, you can enroll them in music classes, art classes, gymnastics, dance, sports, etc. There are computer games and television programs to teach skills. Truly, no matter what you want your child to be exposed to, there is a class for it. Parenting books are full of information on how to mazimize your child's potential and make sure that he or she is educationally stimulated. There is nothing wrong with an activity or two to enrich a child's life. I have attended a weekly playgroup since my older son was 10 months old - it is as much an outlet for me to meet with other like-minded moms as it is enjoyable for my children. I also did music classes when they were small. As they got older, we switched to storytimes at the library which Isaac and I still go to while David is in school. David now participates in sports. Doing activities can be fun for both the child and the parent. It is important to realize, however, that perhaps the most important activity that a child can engage in is play. Play is a child's work. While almost everything else can be learned later in life, an imagination can only be fully formed and developed in childhood. A child needs time to daydream. They need time to pretend both by themselves and with other children. They need paper, crayons, scissors and glue to draw pictures and make creations. Children are often so busy today going from scheduled activity to scheduled activity that they don't have the time to engage in this important work of imagination. This morning before we had to bring David to school, my boys were busy playing a game of "pizza parlor." I don't know how it started but there they were, taking orders and tossing blankets in the air to make pizzas. They were so focused on what they were doing, they literally couldn't even hear me urging them to get dressed, so I got them dressed - pulling off their pjs and putting on their clothes for the day - while they continued with their game. We did manage to get out the door and they returned to "reality" but their temporary flight of imagination was beautiful to watch. Children need time to just be children. Be sure to leave enough unscheduled time in their lives for them to do that. It has been brutally cold in these parts the past few days with wind chills below zero. Yet, amidst this late winter blast of arctic air, my daffodils are beginning to push through the ground. Those little green sprouts are a sure sign that spring is indeed right around the corner. What are the things that make you "you"? Sometimes we try to hide our uniqueness in order to blend in with the crowd. We don't want to be noticed. We want people to like us and so we try to not be controversial in any way. But God made each one of us special. He gave us our personality traits. He gave us our talents. Don't hide your light under a bushel basket! Embrace the person God made you to be! Susan Handle Terbay, a fellow Catholic Mom columnist, graciously gave me the permission to reprint her article here. Visit Susan's website at www.susanhandle.com. The holy season of Lent is upon us. As an older mother I find that I now have more time to meditate and be able to put aside some time for solitude and reflection during the Lenten Season. As a young mother finding such times was a challenge and often I failed to succeed. A quick ‘Hi God, how am I doing?’ was about all I could pray during the day and ‘Thank You God’ before I went to sleep. Mass on Sunday was the only time I had for any serious time with God and even at that there were moments of distraction. This morning as I thought about the next 40 days of my own personal journey of Lent, I thought of Mary and what her journey must have been like. As a young woman, I figured Mary might have had it pretty easy. After all, she had a husband who adored her, who made a decent living as a carpenter and had the ‘perfect’ Son. What problems could she possibly have to face? How could I as a woman and a mother even begin to relate to such a woman, wife, or mother? First of all as a woman, Mary faced a lot of challenges in a culture in which she was subject to male dominance. Hmmm – let’s see, how many women around our world can relate to that? I don’t know for sure how much Joseph made as a carpenter. Financially things had to be challenging simply because they were Jews living under the rule of Romans. I’m sure any money made was subject to heavy taxes so a savings account was probably not feasible. Then there is the ‘perfect’ Son. I seriously doubt that Mary was ever called to school to sit and discuss Jesus’ unacceptable behavior, or having to reprimand Him for hitting a baseball into a neighbor’s window or taking the car away because of irresponsible choices. If Mary was willing to say ‘yes’ to God about being the Mother of God’s Son, then I think she certainly managed the household very well on whatever Joseph made through his carpentry. While Jesus may have been the Son of God, His life wasn’t troubled free. He certainly faced challenges in this life because of His actions. I can only speculate what family life must have been like for Mary, Joseph and Jesus. My gut tells me there was lots of love between them, expressed in various ways and a sense of respect and acceptance of each other; a great foundation for a young boy to grow to manhood. We don’t read much in the Bible about Joseph or Mary. We read snippets of Mary and what we read about her are powerful moments. But for me it is what we don’t read about her that speaks more of how powerful a woman she truly is and how we can look to her as women and mothers in our own journeys. Through her own life choices, her love of Joseph, her love of family and friends and certainly her love of her child, Jesus, she laid the groundwork, the foundation of who Jesus became. She was the human force behind Jesus. In a quiet unassuming way, she gave us a map for our own journeys. Mary felt the same pain as all mothers feel when their child gets hurt, or knows the worry of when a child leaves to go to an event and she knows of the laughter and giggles at the jokes and silliness of a child’s antics. Mary knows because Mary was a mother. Mary knew, as we as mother’s know, that the child given to us is not ‘our’ child to keep but to have only briefly to love, nourish and encourage and then to let go to live their own lives. Mary knows the feeling of watching a grown child leave the home, knowing that the world outside her arms is not as accepting and loving. Mary knows the horror of watching a child die a horrific death and not being able to stop it but only to watch in agony. Mary knows the aloneness of having those she loved all her life gone from her life. Mary knows what it is like to be a woman and to be a mother because she loved, and said yes and took the chance to walk such a journey. Motherhood is its own journey and even if we think no one understands, Mary does. May we look to her for guidance and for strength this holy Lenten Season and understand her pain on Good Friday and her joy on Easter Sunday because we are mothers and we do understand. This is the most recent message of Mary from Medjugorje, dated February 25, 2007. Dear Children! Open your hearts to God's Mercy in this Lenten time. The Heavenly Father desires to deliver each of you from slavery of sin. Therefore, little children, make good use of this time and through meeting with God in confession, leave sin and decide for holiness. Do this out of love for Jesus, who redeemed you all with His blood, that you may be happy and in peace. Do not forget, little children: Your freedom is your weakness, therefore follow my message with seriousness. Thank you for having responded to my call. During this season of Lent, I invite you to spend some time meditating on Jesus' road to Calvary, and on the ways we can better carry our own crosses in life. Dear Lord, help me to keep going even when I feel I can't take another step. Even in his darkest hour, Jesus' Mother Mary was there. Simon wasn't looking to help. He was just one of the crowd, but he was pressed into service. There are many times I don't want to help, either. It's easy to turn away and think someone else will do the work. Dear Lord, help me to help wherever I am needed. Don't let me turn my back on anyone in need. Dear Lord, please help me to share my material goods with others, to feed the hungry and clothe the naked. Also let me help those who are emotionally naked and who have been left exposed to the world. Help me to never revel in another person's shame but to instead reach out a helping hand or offer a word on her behalf. Jesus suffered immeasurable torment on the cross, both physical and emotional. He cried out to his father in heaven, "My God, My God, why have you abandoned me?" Yet he also found the strength to forgive his persecutors. Jesus was taken down from the cross and his lifeless body was laid in his nother's arms. The pain Mary must have felt as she held her son. She was the mother of a convicted criminal. Truly a "sword had pierced her heart." And then there was darkness. The tomb was a place of transition for Jesus - a stopping place between death and new life. Isaac was having a rough day today - maybe it was the full moon. Maybe it is just that he is four and still somewhat prone to having "moments." We went grocery shopping, and as usual, he and David hung out at the on-site kids club they have in our store while Bernie and I did the shopping. As I always do, I picked up the kids at the kids club after checking out while Bernie put the bags in the car. Except Isaac didn't want to leave and was quite vocal about this. Once I got him out of the kids club, he wanted to go look at some of the "Peeps" - those little marshmallow chicks that come out at Easter time. They had a huge display. He started crying that he wanted some blue Peeps - blue being his favorite color. I told him, "Not today but maybe there will be some in your Easter basket." He started screaming at the top of his lungs - "No. I want Peeps today!" Of course, I couldn't give in and reward the behavior even though quite a bit of negative attention was heading my direction. It was one of those wonderful moments in which people with no children look on and say "My child would never act like that!" and you can only imagine what a bad mother people must think you are. I did manage to get both boys out of the store and to get Isaac's attention focused on something else. Alls well that ends well, I suppose, but public temper tantrums are never fun. According to this week's copy of Take Five for Faith, today is the World Day of Prayer. It is an ecumenical effort of women in 170 countries that encourages women "to become aware of the whole world and no longer live in isolation; to be enriched by the faith experience of Christians of other countries and cultures; to take up the burdens of other people and pray with and for them; to become aware of their talents and use them in service of society." Sounds good to me. Join me in saying a prayer today for women all around the world. Peggy Weber is a columnist for my local diocesan newspaper, “The Catholic Observer.” I have been a huge fan of her column “Spun from the Web,” in which she writes honest reflections about her life and her family as they relate to the spiritual journey, for the last twenty years. I had never before had the opportunity to read her self-published book, “Weaving a Family” until now. I had shied away from the book, thinking it would be a simple replay of her columns, but a friend of mine recommended it and pulled it off her bookshelf for me to read. I was truly impressed by Weber’s writing in this book. Written in 1996, her children were 14, 12 and 8 years old at the time. Being a faithful reader of her column, I have had a window into these children’s lives. They are adults now and have all turned out amazingly well. This fact gives even greater credence to her parenting advice. She uses the metaphor of weaving a cloth to describe the way life shapes a family’s story. The pattern won’t always be what one expects. There will be colors and fibers one didn’t plan for. There will be times when the cloth comes unraveled and needs to be rewoven. The cloth is a work in progress. Weber’s chapters cover the full gamut of family life, from the marriage that holds it all together to communication to coping with money matters and surviving the death of a loved one. It offers a mini-course in living a meaningful family life rooted in faith. Weber uses wonderful anecdotes from her own life to illustrate the lessons she has learned. Each chapter ends with a brief reflection and “Weaving Lessons,” a bulleted list of key points she hopes you will take away from that chapter. As I read “Weaving a Family,” I found myself nodding heartily in agreement. This book is a wonderful manual for shaping family life. "I truly believe that most parents I have met love their children dearly and try to provide them with the best in life. But so often they neglect the soul of the child. They leave them hungry for meaning in life and naked to face the world as an adult. . . Nothing makes sense unless one believes. Children can choose to reject their faith or even change it when they are older. But it is the obligation of parents to communicate faith and morals to the family. It is not enough to provide for the physical, educational, and emotional needs of a child. They hunger for a spiritual and moral life. It must be there."